salted mint & rose watermelon salad with peach vinegar. I'm in holiday mode. I'm in holiday mood. Tomorrow I'm jumping on a plane, off to spend a few days in Byron Bay, and then a few days in Sydney. You know what else makes me feel like I'm on vacation? 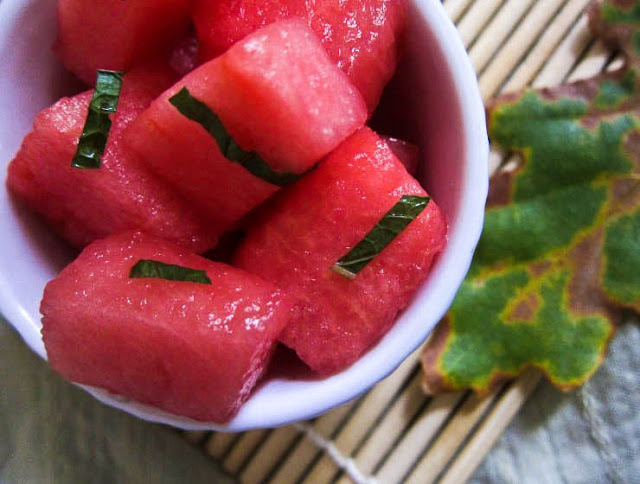 Watermelon on a sunny day. Watermelon in bed. Watermelon with friends. Watermelon anytime, really. 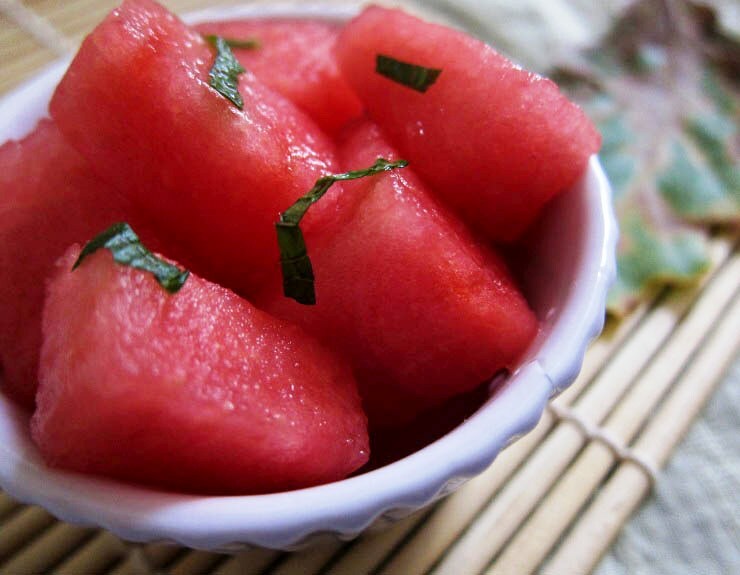 It's almost impossible to feel agitated while chomping on a sweet, icy piece of watermelon. It's relaxation therapy via fruity hydration. Mix all the ingredients together in a bowl. Serve cold. Note: For strict vegans, make sure the vinegar you use for creating the peach vinegar is of vegan persuasion. Otherwise, go for apple cider vinegar, which as far as I know is invariably vegan. salted watermelon salad with mint, rose, and peach vinegar. It sounds wonderful. I had no idea there were non-vegan vinegars! It's kind of like wine - sometimes the processes involve animal by-products, apparently. Was mulling over whether to leave that note in, actually, as I figured those who were serious about being vegan would know anyway. This would rock so much right now! THE HEAT!!! I've only ever made watermelon and feta salad; love this dairy-free take! oh... very refreshing indeed! and healthy. It's really satisfying being way over here on the other side of the world and seeing luscious pieces of scented watermelon. My mouth immediately began to water! You had me at peach vinegar. I swear this would make a perfect summer salad alongside some BBQ ribs and wings. Watermelon and rose are meant for each other. I'm going to be posting a very similar recipe very soon. Delicious. Anything with the prefix 'icy' just makes me feel incredibly cold right now, but I know that in time, it will be welcoming. This looks so yummy! Would have been perfect for me yesterday as it was really sunny here... but today not so much. I'll wait until it's warmer again, then give this a go! I've never been swayed by watermelon salad - but the addition of peach vinegar and rose water has me sold. Thanks for sharing. Hope you enjoyed your holiday. The peach vinegar is completely new to me. Looking forward to checking out your recipe. This sounds so good! What a great looking salad. I have a recipe for a watermelon salad that is with fetta, olives and mint. But I think your dressing with the peach vinegar is a 'must try'. Oh Yum. This looks so delicious and fresh. I am up for watermelon at any time, and can eat massive quantities of it. For me, due to where I live, watermelon is purely a summer treat, and so come June, I make up for my sad winter lack of watermelon and eat myself happy. To me it means summer, sun, green grass, and beach towels. This is such a creative way to use it! Nothing like watermelon on a sunny day and there are so many other gorgeous flavours and textures going on here... I hope you're having a lovely holiday surrounded by brilliant light :). how interesting! I am curious to try this out! So fresh and fabulous! love the sound of your peach vinegar too! Really glad to have some time to catch up on your blog... it's been a crazy month so I have quite a bit of reading to do! I love the flavor combination here and couldn't agree more on your feelings for watermelon. I'm intrigued by this peach vinegar you speak of!